Note: Setting poisons for rats is a hazardous activity that is best left to professionals. The following information is presented for informational purposes only. Always be sure to read and follow all label instructions when using any pesticide product. Rat poisons should be looked upon as an adjunct to exclusion and trapping, not as a replacement for non-chemical rat-control measures. Like all pesticides, rat poisons are toxic chemicals designed to kill a living thing. In this case, the living thing is a rat, which as a mammal shares more physiology and biochemistry with humans than most of us like to admit. That alone should give one pause about using rodenticides when safer, non-chemical rat control alternatives are available. It should also impress upon us the importance of using rat poisons wisely and cautiously when they are necessary. Poison baits designed to exterminate rats are also toxic to humans and many other animals. Although the amount of rodenticide that would be needed to kill a larger animal will almost always be more than that needed to kill a rat, many domestic pets and other non-target animals, and occasionally humans, are accidentally poisoned by rodenticides every year. Some rodenticides exhibit secondary toxicity, which means that the a poisoned rat may itself become toxic to other animals. If another animal like a dog or cat eats the poisoned rat or its carcass, that animal may in turn be poisoned by the rodenticide remaining in the rat's body. Because it may take several days for a rat to die after eating most rodenticides, poisoned rats can die inside wall voids or other inaccessible structural elements of a building. Aside from the stench (which can be overpowering and may last for several weeks), rat carcasses serve as a breeding medium for flies and other pests. Displaced ectoparasites like fleas, ticks, and mites will often seek new hosts when the rat they were parasitizing dies. Many of these parasites are vectors of potentially serious diseases. Rodenticide baits enable effective control of even large rat populations where trapping would be impractical. Using weather-resistant baits in tamper-resistant bait stations provides fairly long-term, wide-area control with minimal maintenance. Rodenticide baits in tamper-resistant bait stations can be used outdoors, whereas few rat traps are suitable for outdoor use. Professional exterminators usually use rodenticides mainly in rat-prone exterior areas. There is rarely a reason or justification to use rat poison inside any building (especially a residential one) unless the building is scheduled to be demolished. Most food-processing plants, for example, have tamper-resistant rat bait stations surrounding the exterior of the building. But you'll rarely, if ever, find rat poison inside a regulated food-processing plant. 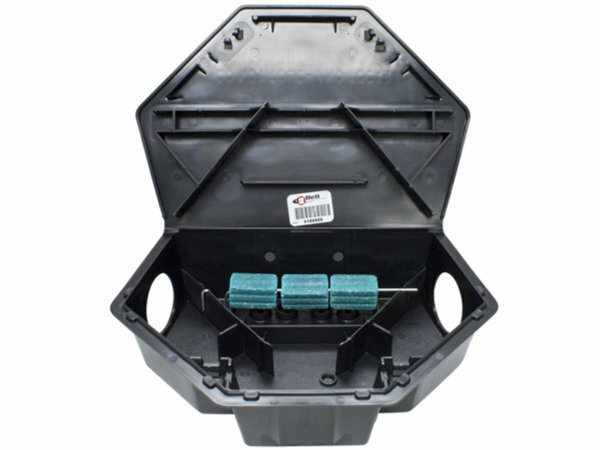 The single most important rule of using rat poisons is to use tamper-resistant bait stations, like the Protecta LP Rat Bait Station shown here. When properly installed and secured, tamper-resistant bait stations help make rat poisons less accessible to children, pets, or non-target animals. They also protect the bait from the weather and help keep it fresh for a longer time, and encourage rats to eat their fill because the rats feel more protected inside the station than they would out in the open. In other words, using bait stations not only reduces risk, but also increases the effectiveness of the rat-control program. Another advantage of using bait stations is that the person responsible for the rat control program can tell a lot from what he or she finds when checking the bait stations. If all the bait is always consumed, for example, they have a bigger rat problem than they thought and need to either use more bait stations or fill them more often. Another example would be that if all the bait on one side of the building is consumed, but little or none on the other side of the building, it can help pinpoint the direction the rats are coming from. Finally, when the rats stop taking the bait, there's a pretty good chance that the infestation has been eliminated for the time being. The placement of bait stations is similar to that of traps. The stations are secured in place along rat travel paths, the rodenticide bait is secured inside the station, and the station is closed and locked. The usual spacing between rat bait stations is between 15 and 30 feet (roughly 4.5 to 9 meters), but they can be placed closer together if needed due to a heavy infestation. When both rats and mice are being controlled, the stations should be no farther apart than about 10 feet (about 3 meters) because mice have shorter travel ranges. Bait stations installed inside buildings (for example, in a boiler room or basement) are usually secured to the floors or walls using screws, nails, lag anchors, or construction adhesive. Exterior bait stations can be secured by attaching them the exterior walls of a building, or they can be secured to the ground using stakes, lag anchors, or earth anchors, depending on the substrate. All bait stations must be sufficiently secured that a child or domestic animal cannot move, shake, or open them. Remember that a bait station is not considered tamper-resistant unless it is properly secured. Exterior bait stations are typically mounted along exterior walls of buildings, along fence lines, along wharfs and piers, and in other rat-prone areas adjacent to structures. They can also be anchored to the ground adjacent to rodent burrows, hidden in ground cover near shrubbery, under sheds, and in garbage storage areas. They should not be used in areas frequented by children or in places likely to be flooded. All bait stations sold in the United States come with labels that can be attached to the stations. At a bare minimum, these labels must contain the trade name of the bait, its active ingredient, its EPA registration number, and the phone number of the responsible person who has the full label in his or her possession. Many states and localities have additional requirements. 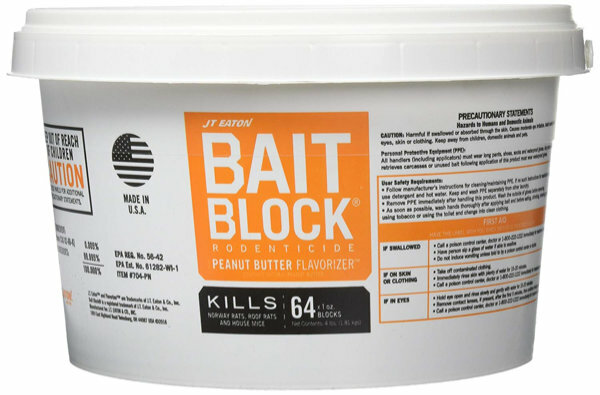 Almost all of the rodenticides available to unlicensed individuals in the United States are anticoagulants, such as the JT Eaton 704-PN Bait Block shown here. Anticoagulant baits are widely considered to be much less hazardous than other types of rat poisons because they are slower-acting and more easily-antidoted in the event of accidental poisoning. I strongly recommend that if you do use rodenticides, you start with an anticoagulant. With the exception of warfarin, anticoagulant resistance is relatively low in rodents; and anticoagulant baits are the most easily-antidoted in the event of accidental poisonings. Some of the more common anticoagulant active ingredients in over-the-counter rat poisons are bromadiolone, chlorophacinone, diphacinone, difethialone, brodifacoum, and warfarin. Warfarin is rarely used anymore because many rats are resistant to it, but it's still legal and can be found in very inexpensive rodenticides. Paraffinized anticoagulant baits come in a variety of shapes and sizes to fit popular bait stations. Baits sealed in paraffin are more weather resistant than grain or meal baits, are less likely to be tracked by rodents through sensitive areas, and may actually be better accepted by rats because they provide something for them to gnaw on. I strongly recommend that if you choose to use rat poison, you use one in a paraffinized block formulation. Anticoagulants work by inhibiting an enzyme that the body needs in order to recycle Vitamin K, which is essential to blood clotting (among other things). Without that enzyme, the rat will exhaust its reserve supply of vitamin K; and once that happens, the rat will begin the process of dying from internal bleeding. All of the anticoagulant baits available over-the-counter are multiple-feeding baits. That means that rats don't usually consume a lethal dose in a single feeding. It also will take anywhere from a few days to more than a week for the rat to die even after it has consumed a lethal dose of an anticoagulant. The exact time will depend on multiple factors including the rat's previous state of health and what else it is eating. Many pet foods, for example, contain Vitamin K, which will at least partially antidote the anticoagulant and delay (or much less likely, prevent) the rat's death. There are a handful of over-the-counter rodenticides that are not anticoagulants. The most common of these contain cholecalciferol, which is Vitamin D3. 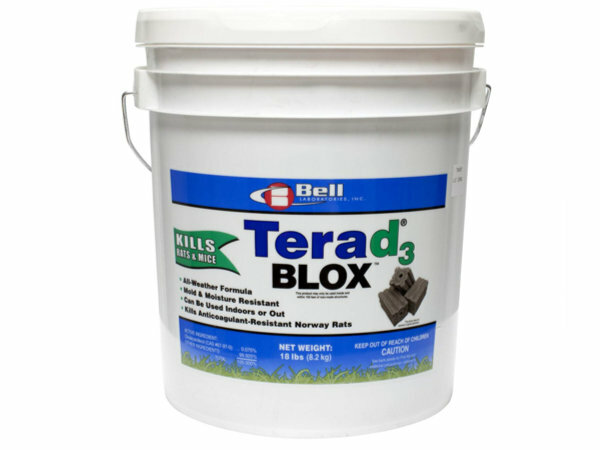 One of the more popular cholecalciferol rodenticides is Terad3. Cholecalciferol is an essential nutrient for rats, people, and most other animals. But when taken to the point of overdose, it increases the level of calcium in the blood to toxic levels. This disrupts all of the body's systems, but especially the heart, blood vessels, nervous system, and kidneys. Unlike anticoagulant baits, rats often will consume a lethal dose of cholecalciferol in a single feeding; but it usually will take a few days for the rat to die. Just as with any animal, a healthy rat's body is able to regulate its calcium levels. It usually takes a few days before an overdose of cholecalciferol will overwhelm that ability and cause the rat to die. I have mixed feelings about cholecalciferol baits. On the one hand, they do have very low rates of resistance (almost zero) in rats. They also tend to work a bit more quickly than anticoagulants. In terms of effectiveness, they're good rodenticides. On the other hand, the incidence of accidental poisonings of pets and other non-target animals is proportionally higher when using cholecalciferol than when using anticoagulants. Cholecalciferol does have an antidote (a hormone called calcitonin); but because of the similarity of early cholecalciferol poisoning symptoms to common illnesses, treatment is often delayed. This may result in permanent damage to pets (or people) who survive the poisoning, especially to their kidneys and nervous system. My advice is to always choose the least-hazardous pesticide that will do the job. Anticoagulants are the least-hazardous and most easily-antidoted rodenticides, and most of the time, they work just fine. So my advice is to start with an anticoagulant bait first, and switch to a cholecalciferol bait only if you encounter resistance and the anticoagulant bait doesn't work. One non-anticoagulant rodenticide that I urge you not to use is bromethalin, my reason being that there is no specific antidote, nor even any reliable treatment once symptoms have begun to show. A pet or person who accidentally ingests enough bromethalin will probably die. If they do survive, it's very likely that they will have permanent nervous system damage. Bromethalin is a neurotoxic chemical that exerts its effect in the mitochondria of the central nervous system. It interferes with the ability to produce adenosine triphosphate, which in turn inhibits the sodium-potassium pump that is essential for nerves to function. It also results in increased volume and pressure of the cerebro-spinal fluid and the development of vacuoles under the myelin sheaths of the nerves. The next step in rats or untreated pets is usually convulsions, followed by death from respiratory paralysis. Humans who are exposed to a single, sufficient dose of bromethalin may experience other symptoms such as cognitive impairment, delusions, and hallucinations, as well as temporary or permanent paralysis if they do survive the poisoning. Professional exterminators often use bromethalin because it's fast and effective, and few if any rodents are resistant to it. Accidental poisoning is also rather unlikely if bromethalin is used properly. The problem that I have with it is that if an accidental poisoning does happen, there's no reliable treatment. Even if the person or animal survives, they are extremely likely to have serious and permanent disabilities. As long as other effective rodenticides exist, I can't think of a good reason to use bromethalin. I personally will not use it, and I urge you not to, either.